His attempts to raise funds began immediately when he asked how much money he could get if he vacuumed the floors. That night Preston set a goal to honor every veteran at the McDonald cemetery in Redding with the placement of a flag and a flower. Using social media, word of Preston’s effort and goal spread and the Sunday visits to McDonald cemetery began to draw other community members, some from more than 60 miles away. As Preston began to realize his goal of honoring all veterans at the McDonald cemetery he extended his goal to include veterans at other Redding cemeteries, then it was veterans in Shasta County, then the neighboring counties were brought in too. Preston then set a goal to honor veterans in every township along Interstate 5 between Redding and Sacramento, a 160 mile stretch of highway. Having met that goal Preston has set a new goal to honor veterans in all 50 states and to challenge others to get involved wherever they are through the Flag and Flower Challenge (#FandFChallenge). This is a challenge for those across the United States, and other countries, where US Service men and women are buried, to place a US Flag and a flower and THANK a veteran for their service. 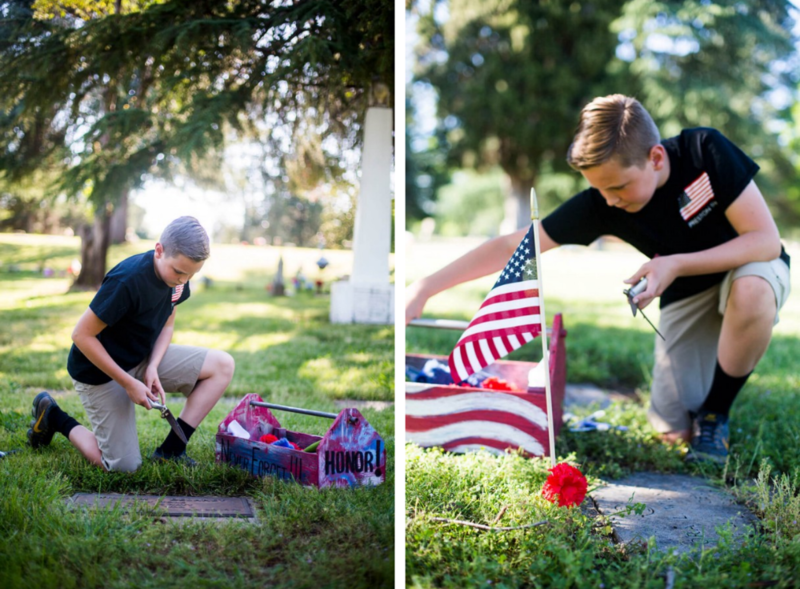 Over the last 3 years, Preston has organized the placement of over 50,000 US flags and artificial red carnations at veteran’s gravesites in 11 states, and he’s not stopping here. Over the last two and half years, Preston has worked tirelessly to raise money for his cause. He has carefully used each donation made so far to give back to veterans across the nation, but there are still so many more he wants to honor. Obviously, Preston has not accomplished this on his own. At each cemetery we visit, community members come out to meet Preston and help clean gravesites and say “Thank You” to those who have provided service to our country. If you come out to help, Preston has specific expectations. It isn’t just placing a flag and a flower at each headstone, Preston wants each veteran to be thanked personally by saying out loud the veteran’s name and to thank them for their service. Preston is quite specific about saying the veteran’s name out loud, as he feels that a veteran’s name not said out loud is a veteran forgotten. Preston doesn’t honor only the fallen veterans, he also visits a local home for veterans and enjoys listening to their stories, sometimes going out to lunch or dinner with them. It was through one of these visits that Preston met a veteran, Tim, who had to give up his beloved dog, Rusty, when he moved into the Veterans home. For Christmas 2016, Preston asked me if Rusty could live with us so that Tim could still see his dog whenever he wanted. Rusty now lives happily with us and Tim drops by regularly to visit. Preston has spoken in front of countless groups to share his conviction and to raise funding to meet his goals. The greatest ongoing concern with Preston’s goals is raising the funds to purchase the flags and flowers and travel to the out-of-state cemeteries. 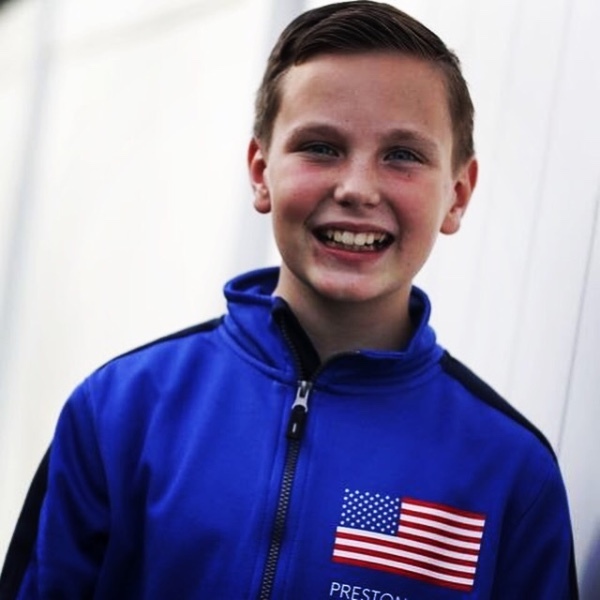 Preston plans on using his summer vacation to honor veterans across the nation and we need your help! Honoring a single veteran costs about $3 and with Preston’s big dreams, we can’t do this alone. • Goal #1: $65,000 will help Preston to honor veterans at 1 out-of-state cemetery. • Goal #2: $100,000 will help Preston to honor veterans at 4 out-of-state cemeteries. • Goal #3: $150,000 will help Preston to honor veterans at 8 out-of-state cemeteries. Each donation helps Preston come closer to his goal of honoring veterans in all 50 states. Even if you can’t donate, you can still help Preston by completing the #FandFChallenge, saying “Thank you” and recognizing the services that veterans have provided to this great nation, and by sharing this campaign. Thank you so much! Preston is so excited to be selected, but more importantly, Preston is excited to share his mission with even more people. He is working towards his goal of honoring veterans in all 50 states and he needs your help to do it. Please continue to share his campaign and spread the word! With Memorial Day right around the corner, it's important to honor those who have fought for our country, but Preston wants us to remember that we can honor veterans everyday, not just on a holiday. The story of Preston honoring veterans began more than two years ago, Veteran’s Day 2015. 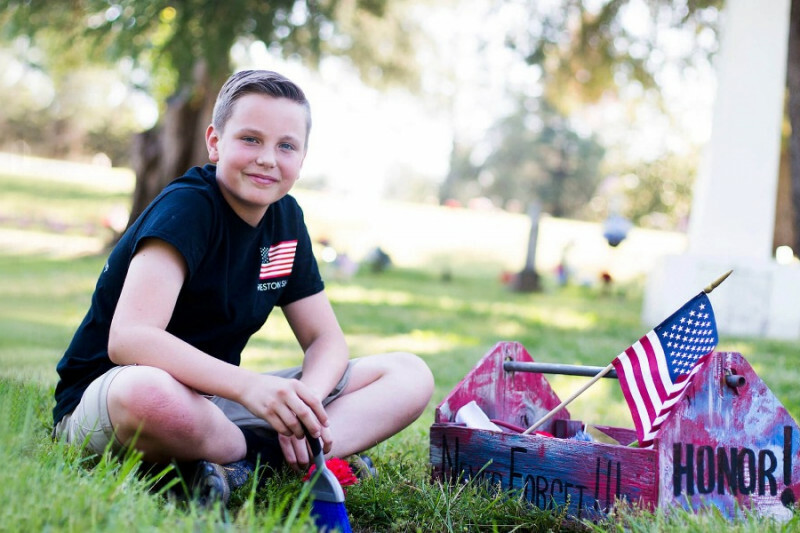 On that day Preston visited his grandfather’s grave at a Redding, California, cemetery to place a flag and flowers in memorial to his grandfather’s service in the US Navy. It was during this visit that Preston, then just 10 years old, became upset when he noticed that other local veterans were not being honored on this special day with a flag or a flower. Being a normal ten-year-old he continued to verbalize his irritation throughout the day, so I eventually advised him that “You can’t complain about something unless you try to do something about it.” Preston’s response was a look of conviction and the words “I’m going to do something about it Mom!” His attempts to raise funds began immediately when he asked how much money he could get if he vacuumed the floors. That night Preston set a goal to honor every veteran at the McDonald cemetery in Redding with the placement of a flag and a flower. Using social media, word of Preston’s effort and goal spread and the Sunday visits to McDonalds cemetery began to draw other community members, some from more than 60 miles away. As Preston began to realize his goal of honoring all veterans at the McDonald cemetery he extended his goal to include veterans at other Redding cemeteries, then it was veterans in Shasta County, then the neighboring counties were brought in too. Preston then set a goal to honor veterans in every township along Interstate 5 between Redding and Sacramento, a 160 mile stretch of highway. Having met that goal Preston has set a new goal to honor veterans in all 50 states and to challenge others to get involved wherever they are through the Flag and Flower Challenge (#FandFChallenge). A challenge for those across the United States, and other countries where US Service men and women are buried, to go out with a US Flag and a flower and THANK a veteran for their service. 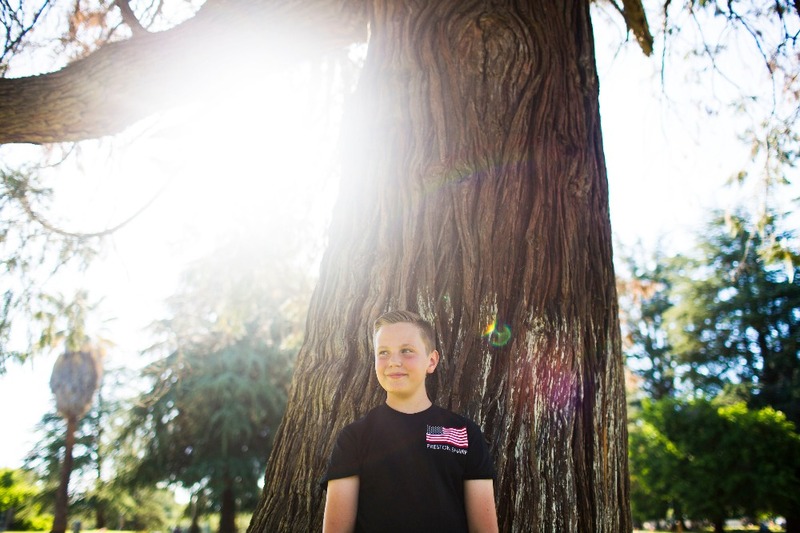 So far Preston has met his goals of honoring veterans in Redding, Shasta County and he fulfilled his goal of reaching Sacramento during the summer of 2017. For his goal of honoring veterans in all 50 states he has visited cemeteries in California, Nevada, Oregon, Virginia and Florida. As of January 2018, Preston has organized the placement of over 40,000 US flags and artificial red carnations at veteran’s gravesites. Obviously, Preston has not accomplished this on his own. At each cemetery visited more community members come out to meet Preston, to help clean gravesites and to say, “Thank You” to those who have provided service to our country. If you come out to help, Preston has specific expectations. It isn’t just placing a flag and a flower at each headstone, Preston wants each veteran to be thanked personally by saying out loud the veteran’s name and to thank them for their service. Preston is quite specific about saying the veteran’s name out loud, as he feels that a veteran’s name not said out loud is a veteran forgotten. Preston doesn’t honor only the fallen veterans, he also visits a local home for veterans and enjoys listening to their stories, sometimes going out to lunch or dinner with them. It was through one of these visits that Preston met a veteran who had to give up his dog when he moved into the Veterans home and the dog was in Oregon so he wasn’t even able to visit him. It was for Christmas 2016 that Preston asked if instead of the laptop he had asked for could we please adopt Rusty, the veteran’s dog, so that the veteran could still see his dog whenever he wanted. The greatest ongoing concern with Preston’s goals is raising the funds to purchase the flags and the artificial red carnations. Preston has spoken in front of countless groups to share his conviction and to raise funding to meet his goals. Preston says that he won't stop honoring veterans until he can't bend down anymore. His motto is "We need to honor veterans EVERYDAY and not just on a Holiday." •	For every person in the United States to take the time to honor a veteran. Either by completing the #FandFChallenge, taking a veteran to lunch or even just saying “Thank you” and recognizing the services that veteran’s have provided to this great nation. •	Honor veterans in at least one cemetery in every state not yet visited. When he is visiting each state, he would also like to meet with a group of veterans to hear their stories over lunch or dinner. •	To be able to send US flags and artificial red carnations to groups of people so that they too can honor veterans in their communities. Preston has been contacted by teachers and other groups asking about obtaining flags and flowers, so they can honor veterans in their area. o	In 2016 Preston became acquainted with leadership of the local Veteran’s Cemetery in Igo California that is overseen by the California Department of Veterans Affairs. It was from this leadership that Preston learned that flags are not flown at the Veteran’s Cemetery on Veteran’s Day, only on Memorial Day. Leadership recognized that Preston was not going to let this go and didn’t really have a reason to say “No”. So, for the first time, on Veteran’s Day 2016, all veterans at the Igo Veteran’s Cemetery were honored with a US flag. At that time Preston was also able to raise enough funding to place a real red carnation next to each of those 4,500 flags. •	Finally, Preston’s greatest goal, is to obtain the funding to complete these goals and perhaps do even more for veterans. Preston has established a non-profit 501c. THE BEST WAY TO DONATE IS to go to my Wed page prestonsharp.net they take less of a percent out. THANK YOU! I want to honor veterans in every state. So far I have completed Florida, California, Nevada, and Vergina. I started the #fandfchallenge to have everyone honor veterans every day and not just on a holiday. I really need support to continue honoring veterans. It's $3.00 a veteran's stone and I have honored over 39,000. Please help me honor veterans every day and not just on a holiday. Dear Preston, I teach at Little Hocking Elementary School in Ohio and we would like to invite you to join us to tell your story either in person or via Skype to motivate our students and honor our Veterans during our Veteran's Day program. Would you contact me ASAP? Your story is so inspiring for both kids and adults. Thank you, I am so happy to Honor as many Vets as I can. I ordered 540 more flags on Tuesday. I just need to come up with 450 more flowers to go with them. Jessica Brooks ill put an extra flower out for you! Is your grandpa's last name Brooks? This is so awesome. I have four grandfathers out there from both sides of my family and I live in Texas now and don't visit often, but it brings a peace to my heart that this little man is doing this awesome and wonderful thing. May the memories of these people live on forever. I will help put flags out if Preston wants to contact me! So happy to have seen you and Preston at the SOTU. Congrats, Preston and April. You inspire all of us. God bless you. Preston we live in North East Ohio and my son and I would be honored to place flags or join a group wanting to place flags if you can direct us who to contact. Preston, You are to be commended for your attention to our veterans. My 5th great grandfather fought in the war of 1812 and is buried in Campbell, Tennessee. His name was George Sharp!! The same as your grandfather. It makes me wonder if we are related! I would be proud to say you are my cousin!!! George Sharp (1784-1868) Born in Hillsboro, NC and died in Campbell, TN. I am so impressed by what you are doing Preston Sharp that I shared your GoFundMe page on my wall. My father was John W. James Sr. an Air Force man he died 7 years ago and he was buried in Fort Leavenworth. I am hoping to visit his grave. I miss him a lot. I will find a flag and put it on his grave with red carnation. Thank you for your inspiration. Thank you, Preston! Where can I donate to help! Hi! Will the flowers be locally sourced flowers indigenous to each area? Will the flags be made in the United States and of non-toxic natural materials? Let us know so we can more informedly decide if we want to donate. What an.outstanding gentleman! Good going Preston! Preston: You are doing a wonderful thing for veterans and we want to help you spread your story nationally via the work that we do. To see who we are and what we do, go to www.goodwillcommunications.com and if you think we can help, please send me an email with your phone number in case we need to talk personally. We hope we can help you spread your wonderful mission to all the people who support our veterans. hello,i am new to fund me and trying to raise money for my own survival (i am homeless) and veterans. please and thank you. Could not be more proud of your commitment to honor all veterans every day. Thank you Preston Sharp. I feel he is such a sincere young man with his goals of thinking about our men and woman who served in the armed forces. He will be blessed throughout his life! I am a veteran Thank you for looking out for our veterans. It inspires me to know there are kids who are truly concerned about others and want to do something about it. Thank you Preston for caring for others. Your mother sounds like an incredible Lady and mother also. You’re an inspiration! Keep it up. God bless all our Veterans!! My student and I read your article in Time for Kids. We were impressed and wanted to help. Good job!